Netflix offerings are divided nearly equally between children (G/PG), teen (PG-13), and adult (R) programming. To see the complete list of audio described videos available in your country, on a PC or Mac click* the audio description link at the bottom of your Netflix Home page (URL may vary by country) after signing in. (* You must have a Netflix account to access the list. You may sign up for Netflix free for the first month if you wish to sample the service; after that it costs $8-$14/month for unlimited streaming.) The following is subject to change! You can also view the list on an iPad (last entry in the category list on the pull-down menu, just prior to App Settings), Apple TV (under Categories), iPhone (via pull-down menu on top left), and other devices such as Android phones or Amazon Fire products. Alternatively , you may view our alphabetized list of described USA Netflix titles, which is updated frequently. That link is at the top of every page on our website. We also have a listing of USA Netflix titles described in foreign languages. NOTE: If you want audio described DVDs (as opposed to streaming video), after you are signed in as the primary user, click "DVD" at the top of the screen; then hover your cursor over BROWSE, and Audio Description will appear as an option. The fee structure is different if you want DVDs, so you have to sign up for this. If you normally sign in on the DVDs page, click "Watch Instantly" to get to the page mentioned above. 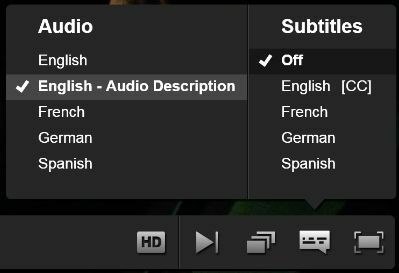 Here's the good news: Once "English - Audio Description" is selected, it will be remembered across devices for the current program and all future programs containing description. So set it once and forget it! 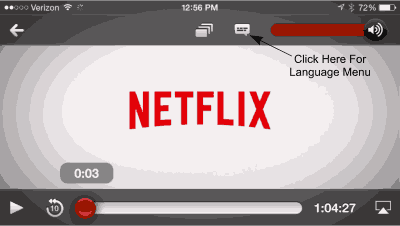 On a browser, there is no easy way for a screen reader user to select description; so have a sighted person hover the mouse over the screen of a video with description to activate the control bar, then use the Languages icon (the next to last one as shown on the bottom of the figure below) to select the Audio menu. For all other devices, Netflix has created a help page entitled How do I adjust subtitles, captions and alternate audio on my device? However, given the popularity of iOS devices (and our personal possession of such ...), we have created our own help information below. On an iPhone, a screen similar to the first one below should appear when you open a stream for viewing. The Language Options menu is the third button. When you click it, the second menu appears, and you select English Audio Description, which is generally the second one down on the left. Click the Done button, top right. On an iPad, a menu similar to the one shown above appears via the Languages pull-down at the top of the screen. On an Apple TV, the process depends on whether or not you have a Generation 4 (available in late 2015) with a touchpad on the remote, or the previous model (Generation 3). The Generation 1 or 2 Apple TVs do not support description, and we do not have any information on Generation 5 (4K), though it is likely similar to Generation 4. For the Gen 4 model, start by swiping down on the remote's touchpad to activate the Options menu. The rest of the process is close to what is described below, except that the initial options may be Info, Subtitles, and Audio, and you want to start by moving to the right to Audio. For previous models without a touchpad (Gen 3 only), you press and hold the large Select button on the 3-button remote to activate the Options menu. In either case, there are two or three categories available: Subtitles, Audio, and maybe Speakers. 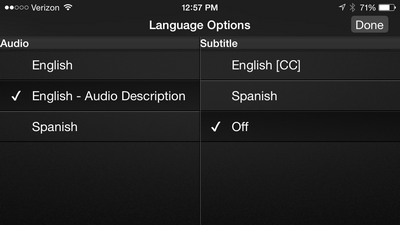 Initially the cursor is found on the first option under Subtitles, which is "Off." To get to the description option, you must cursor up once to get to the categories list, cursor one to the right for Audio, then cursor one down to get to the Languages list. The first option should be "English - Audio Description." Double-click it to select it, and in a moment the video will begin again with that option. These menus are subject to change, so the order may not be exactly correct. If you are unable to access these menus, then perhaps you have a first or second generation Apple TV, which does not support these options. See the link in the earlier section on how to verify your generation number. Other devices should be similar to the options shown above. Or see the Netflix help page. If you are using a browser and you are already signed in to Netflix, you can enter the following link to report a problem: https://www.netflix.com/viewingactivity. In other words, just add "/viewingactivity" to the end of the Netflix URL. If you are using a non-web-based device (like a tablet or Apple TV), navigate to your ACCOUNT section and look for the "Viewing Activity" option. There you will see a history of the shows you have been watching, and to the right of each show there is a "Report a Problem" link. The Netflix Help Desk number is 866-579-7172. Netflix will request audio description tracks in all its new contracts with streaming content providers. For third-party content that is already in the Netflix streaming library, the company “shall make reasonable efforts to obtain existing audio description assets” for those videos. Netflix agreed to add audio description search functions and also make its website and mobile applications accessible to individuals who are blind and use screen-reading software. By Dec. 31, 2016, Netflix would update all apps for all applicable devices to provide blind individuals using screen-reading technology with access to the same features available to sighted users. While Netflix was the first streaming service to offer description, this agreement took its commitment to a new level AND set the stage for negotiated agreements with Amazon, Hulu, and other streaming content providers, as necessary. The ACB worked behind the scenes with Netflix on introducing description, but congratulations are also in order to Robert Kingett for spearheading the effort to get audio description on Netflix. You can read Robert's The Accessible Netflix Project blog.